As featured in today's The i paper, researchers acquired high-resolution images of surgically-resected tumours and used mathematical modelling to run detailed computational experiments. This allowed them to study the transport of blood, biological fluids and drugs, and their complex interactions with tissue. Their new technique, named REANIMATE (REAlistic Numerical Image-based Modelling of biologicAl Tissue substratEs) enables researchers to visualise and interact with large, 3D, virtual models of tumour tissue samples and treat them as living specimens. This will enable scientists to perform complex computational experiments to generate new insights into how individual tumours react to specific treatments. 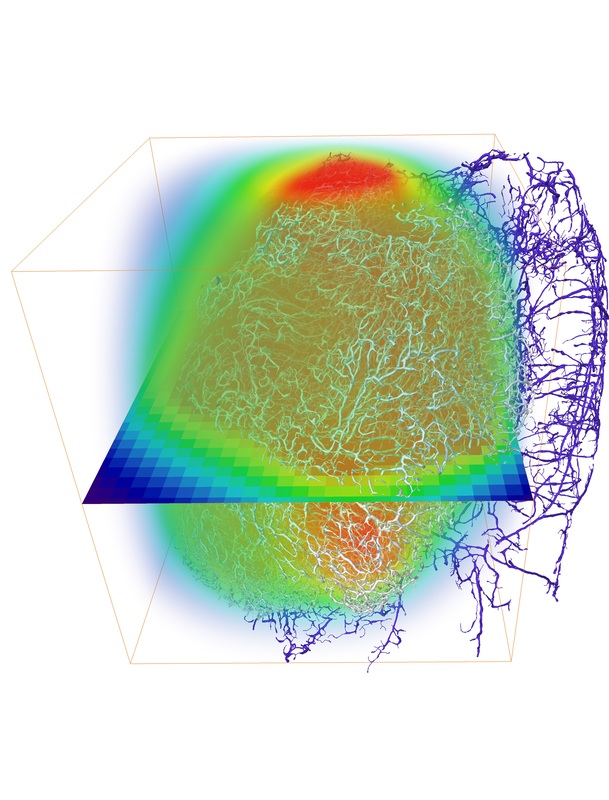 In the study, published in Nature Biomedical Engineering, researchers used optical imaging of extracted tumour tissue that had been rendered transparent using a cocktail of chemical treatments. These can show fine detail such as blood vessel networks and cell nuclei, which can be seen across entire organs at very high resolution by using fluorescently-labelled probes that bind to specific structures. It is predicted that one in two people in the UK will be diagnosed with cancer in their lifetime, with cancer treatment expected to cost the NHS £13.2bn by 2021. The structure of cancer tumours varies widely which makes the delivery of therapeutic drugs difficult, meaning it is hard to predict the uptake of a drug by diseased tissue and its subsequent distribution. This can result in suboptimal dosing and adverse side effects including increased resistance to treatment through exposure. The research was led by Dr Paul Sweeney, Dr Simon Walker-Samuel and Dr Rebecca Shipley, with UCL Division of Medicine, UCL Mechanical Engineering and UCL Institute for Healthcare Engineering, in close collaboration with colleagues and with the support of the Rosetrees Trust and the Wellcome Trust. Read the full paper in Nature Biomedical Engineering.